The first three editions of this acclaimed book presented a much-needed conceptual synthesis of this rapidly moving field. Now, Cancer Cytogenetics, Fourth Edition, offers a comprehensive, expanded, and up-to-date review of recent dramatic advances in this area, incorporating a vast amount of new data from the latest basic and clinical investigations. Professor Sverre Heim has worked within the field of cancer cytogenetics for more than three decades. He has used chromosomal markers to trace the clonal relationships among neoplastic cell populations and determine their patterns of evolution. He has described numerous specific chromosome abnormalities in various hematologic disorders and solid tumors, identified their gene-level consequences, and has shown that the karyotypic and molecular genetic abnormalities have diagnostic as well as prognostic consequences. Dr Heim has served as a member of several editorial boards and scientific advisory committees. He is the author of nearly 500 scientific publications. 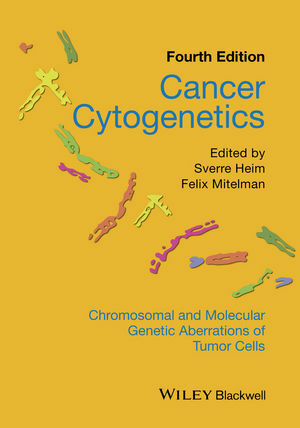 Professor Felix Mitelman has published more than 750 articles in the field of cancer cytogenetics. In the early 1980s, he established a unique database on chromosome changes in cancer – a systematic compilation of reported acquired cytogenetic aberrations, the molecular genetic outcome of the cytogenetic abnormalities, and the clinical consequences of the genetic changes. In 1989, Dr Mitelman founded the journal Genes, Chromosomes & Cancer and he has since served as the Editor-in-Chief. He is an elected member of several distinguished societies, including the Royal Swedish Academy of Sciences and the American Academy of Arts and Sciences.